Voice of the Collector: Finally, a Design to Be Excited About!! 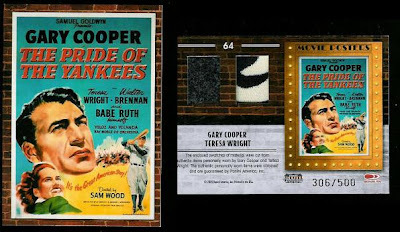 Donruss Americana 2009 went live this week and one insert set in particular, I believe, has taken a step in the right direction with regards to design. Check out the front and back of the this Movie Poster Materials card. Movie posters in and of themselves are cool, throw in the fact that this one depicts a great baseball story starring legendary actor Gary Cooper as the original Iron Man, Lou Gehrig, and you have a winner. But wait, the real key is how they incorporated the worn materials. Instead of disrupting the full image of the movie poster on the front, they inserted the materials and a smaller picture of the movie poster on the back. Regardless of how you feel about Donruss, Hollywood sets, Americana, you have to admit, this is a design that would has great cross-over potential for more traditional sports themed products. Very cool. Thanks for the post. I'd love to see this them developed further.